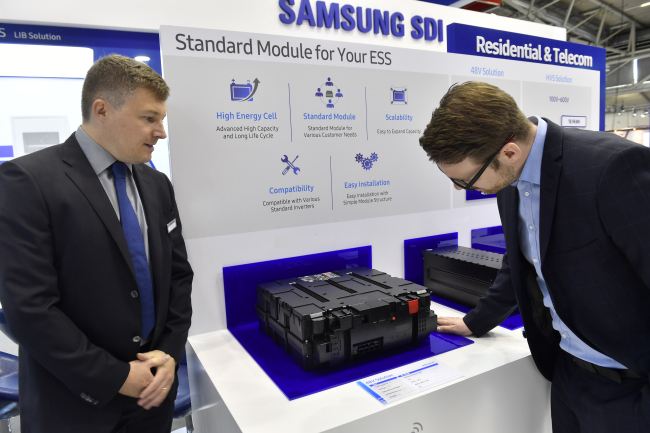 Samsung SDI’s second-quarter operating profit jumped nearly 27-fold compared to a year earlier, showing a solid recovery trend after the battery explosion crisis in 2016, according to the company’s earnings announcement Monday. The battery maker posted 2.25 trillion won in sales and 152.8 billion won in operating profit for the April to June period, the company said in a regulatory filing. The operating profit skyrocketed from 5.5 billion won in the second quarter of last year, when the company swung back into the black after posting deficits for six consecutive quarters due to the Galaxy Note 7 battery debacle. The company’s battery business recorded 1.73 trillion won in sales, up 21.9 percent from the previous quarter, led by the thriving markets for energy storage systems and cylindrical cells, it said.